The Central Bank of the Philippines unexpectedly lowered the key overnight rate to 3% from 4% on June 3, 2016, as it shifted to an interest rate corridor system to “improve the transmission of monetary policy.” Sovereign bonds have had a strong rally since then; the total return rose 10.82% YTD, while the yield-to-maturity tightened 103 bps to 3.21%, according to the S&P Philippines Sovereign Bond Index as of Aug. 4, 2016. The S&P Philippines Government Bond Index, which seeks to track the performance of sovereign bonds, government bills, and agency bonds, rose 10.58% in the same period. Government bonds represent 89% of the overall fixed income market in the Philippines, with a total market value of PHP 4.3 trillion. Additionally, the corporate bond market grew steadily over the 10-year period ending Aug. 4, 2016. The three biggest corporate issuers are Ayala Land, Ayala Corp, and SM Prime Holdings. Though the yield-to-maturity of the S&P Philippines Corporate Bond Index tightened 79 bps to 4.08% YTD, the yields remained attractive for the modified duration, at 4.06%. 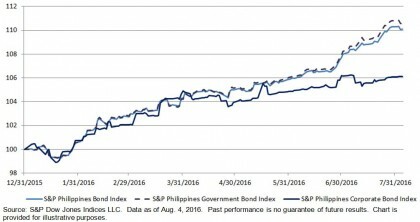 The S&P Philippines Bond Index was the second outperformer YTD among the 10 Pan-Asian countries, delivering a 10.08% YTD total return as of Aug. 4, 2016. The S&P Indonesia Bond Index was the best performer and gained 16.19% during the same period. The Central Bank of the Philippines kept its benchmark interest rate unchanged on June 23, 2016, while indicating that average inflation is likely to settle near the lower edge of the inflation target of 2%-4% this year. The next scheduled interest rate decision will be on Aug. 11, 2016.